A 30-year-old woman presented with a three-year history of chronic low back pain without any other significant symptoms or history of any major illness. Family history was not significant for any major illness. Her systemic examination was unremarkable. X-ray of her pelvis showed multiple small round or oval sclerotic spots of 2–10 mm in size all over her skeleton [Figure 1]. Her blood investigations were within normal limits including her erythrocyte sedimentation rate and serum levels of alkaline phosphatase, calcium, and phosphorus. We performed an X-ray of both hands [Figure 2], which again showed multiple small round sclerotic spots. She was treated symptomatically for low back pain and is doing well. 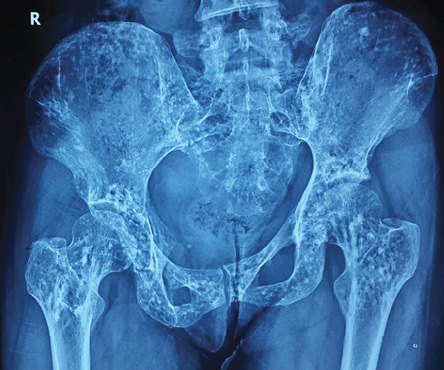 Figure 1: X-ray of the pelvis showing multiple small round or oval sclerotic spots of 2–10 mm in size. Figure 2: X-ray of both hands showing multiple small round or oval sclerotic spots of 2–10 mm in size. Osteopoikilosis (also known as Albers-Schönberg disease, spotted bone disease, or osteopathia condensans disseminata) is a rare, usually asymptomatic bone disorder with an incidence of 1 in 50 000.1 It belongs to a group of conditions known as sclerosing bone dysplasias.2 Albers-Schönberg first described osteopoikilosis in 1915. It is an autosomal dominant disorder, linked to the LEMD-3 gene.3,4 It can also present sporadically, and rarely with joint pain and swelling. Sometimes, it is associated with superficial skin lesions, which are connective tissue nevi (dermatofibrosis lenticularis disseminata) and the condition is known as Buschke-Ollendorff syndrome. Since it is an asymptomatic condition, family history is typically negative, if radiological examination is not done in other family members. Radiologically, it is characterized by the presence of hyperostosis foci at any point in the skeleton, and associated with numerous disorders including Buschke-Ollendorff syndrome, rheumatoid arthritis, scleroderma, ankylosing spondylitis, synovial osteochondromatosis, Klippel-Feil syndrome, cleft palate, Familial Mediterranean fever, endocrine diseases, syndactyly, and melorheostosis.4 The foci of hyperostosis are due to alteration in the maturation of the endochondral bone (impairment of secondary spongiosa resorption and remodeling), which is usually detected between 20–30 years of age. Most of the time, it is a coincidental radiological finding and is not associated with increased risk of pathological fracture. Routine blood examination including serum calcium, phosphorus, and alkaline phosphatase will be normal. 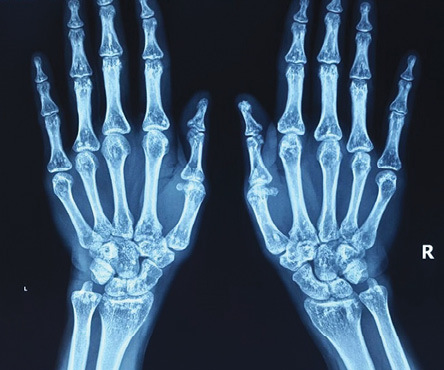 X-ray shows multiple small, well-defined, widely symmetrically distributed round or oval sclerotic spots of 2–10 mm in size all over the skeleton, with a propensity for epiphyseal and metaphyseal involvement.1,3 The preferred sites of radiological involvement include: the phalanges (100%), carpal bones (97.4%), metacarpals (92.5%), feet phalanges (87.2%), metatarsals (84.4%), tarsal bones (84.6%), pelvis (74.4%), femur (74.4%), radius (66.7%), ulna (66.7%), sacrum (58.9%), humerus (28.2%), tibia (20.5%), and fibula (2.8%).5 It has to be differentiated from osteoblastic metastasis, tuberous sclerosis, mastocytosis, melorheostosis, osteopathiastriata, and synovial chondromatosis. Uniform size, symmetrical periarticular distribution with a normal bone scan or slightly increased activity, normal alkaline and acid phosphatase help to differentiate osteopoikilosis from osteoblastic metastasis where there is asymmetry, axial skeleton involvement, bony destruction, and positive bone scan. The bony lesions in tuberous sclerosis and mastocytosis are asymmetric, less well defined, and show lesser periarticular preference compared to osteopoikilosis, helping to differentiate these. Osteopoikilosis usually requires symptomatic treatment only. 1. Jangir RR, Mishra DL, Kumar M, Mathur AK. Osteopoikilosis and its clinical significance: a review of the literature. Research and Reviews. Journal of Medical and Health Sciences 2014;3:11-20. 2. Greenspan A. Sclerosing bone dysplasias–a target-site approach. Skeletal Radiol 1991;20(8):561-583. 3. Serdaroğlu M, Capkin E, Uçüncü F, Tosun M. Case report of a patient with osteopoikilosis. Rheumatol Int 2007 May;27(7):683-686. 4. Baasanjav S, Jamsheer A, Kolanczyk M, Horn D, Latos T, Hoffmann K, et al. Osteopoikilosis and multiple exostoses caused by novel mutations in LEMD3 and EXT1 genes respectively–coincidence within one family. BMC Med Genet 2010 Jul;11:110-117. 5. Khot R, Sikarwar J, Gupta R, Sharma G. Osteopoikilosis: A case report. Ind J Radiol Imag 2005;15:453-454.